As Kobe Bryant enters the twilight of his career, fans have the privilege of watching what was once one of the brightest-burning stars in NBA fade into the night sky. With that being said, it is important to remember the legend that was the Black Mamba. 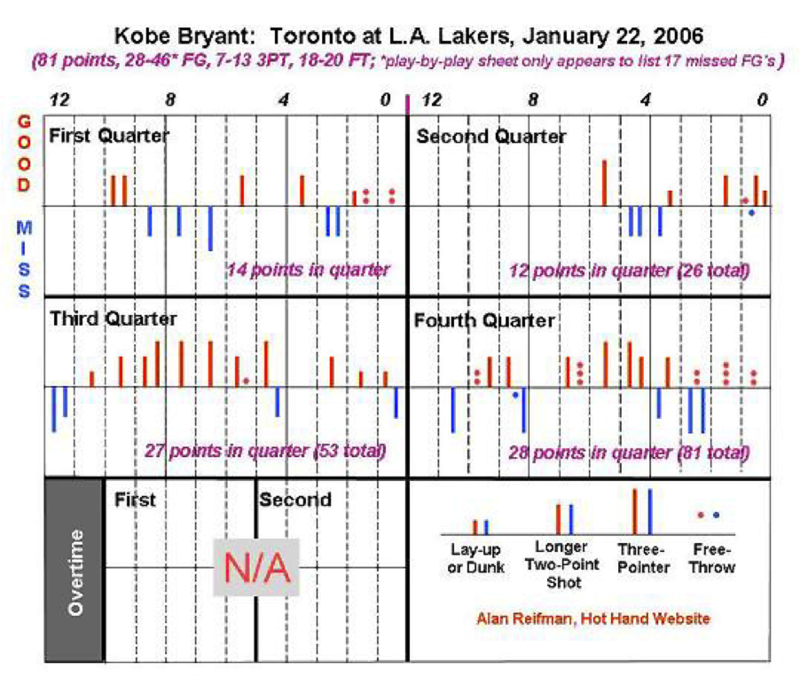 On January 22, 2006 Kobe Bryant embarked on the greatest scoring performance in NBA history. Yes, in all of NBA history, dating back to June of 1946. Most NBA fans would deny this claim and quickly pull up the iconic image of Wilt Chamberlain holding up the number “100”. However, let us first delve deeper. On the night that Wilt Chamberlain dropped 100 points, his Philadelphia Warriors faced off against the dwindling New York Knicks, owners of the 2nd-worst record in the league. In addition, the Knickerbockers were missing starting center Phil Jordan, the man responsible for defending Chamberlain that night. With Jordan sidelined as a result of the flu, it was backup center Darrall Imhoff who briefly opposed Wilt. Imhoff played a mere 20 minutes that night, as a result of quickly getting in foul trouble.1 Subsequently, it was Cleveland Buckner, a 6’9” rookie from Jackson State, who spent the majority of the contest feebly opposing Wilt. While drawing fouls was in part a result of Wilt’s own dominance, it must be noted that his highly-touted scoring feat was accomplished against a 3rd-string Rookie selected in the sixth round, with a 4-inch height disadvantage. Meanwhile, on Kobe Bryant’s historic night, his Los Angeles Lakers faced the Toronto Raptors, another middling team that ultimately finished 12th in its conference. However, Kobe was facing a formidable adversary in Jalen Rose. Rose was a 6’8” member of Michigan’s notorious “Fab Five”, as well as a lottery pick talent who averaged over 20 points per game in multiple seasons. Jalen’s most notable defensive effort was in the 1998 Eastern Conference Finals, in which he emerged as a worthy adversary to Michael Jordan. In four of the last five games of the series, he held Jordan to under 30 points a game and under 45% field goal.2 Needless to say Jalen was much more of a worthy opponent to Kobe Bryant than that of Cleveland Buckner to Wilt Chamberlain. Opponents aside, let’s look into the deeper stats. 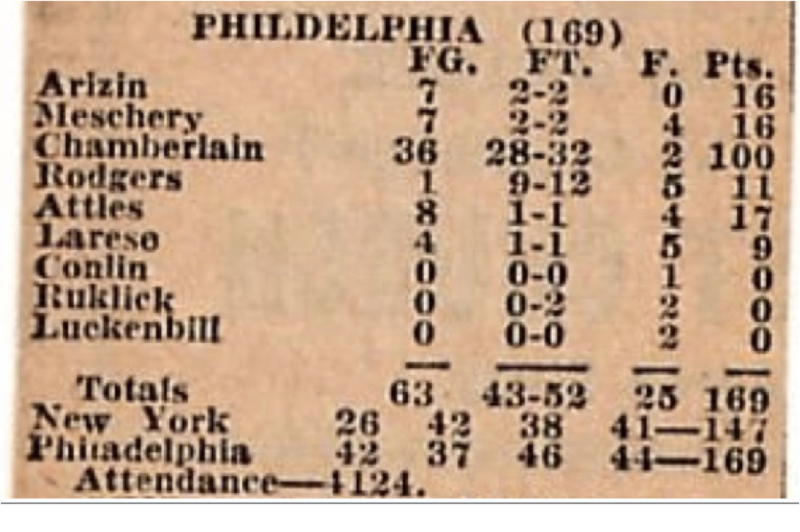 A brief glance at the Philadelphia box score yields an eye-popping 100 points out of Chamberlain and an uncanny 28-32 from the charity stripe. However, taking a closer look, we see Wilt was 36-for-63 from the field.3 63 field goal attempts in a single game is, for lack of a better term, insane! No one in NBA history has even broken 50 before.4 To put that in perspective, Kobe Bryant’s outburst resulted in a 28-46 shooting line, a full 17 fewer field goals attempted. In Kobe’s 2005-2006 season – not his most efficient shooting year but the year of the 81-point game – he averaged 1.3 points per shot attempt5. 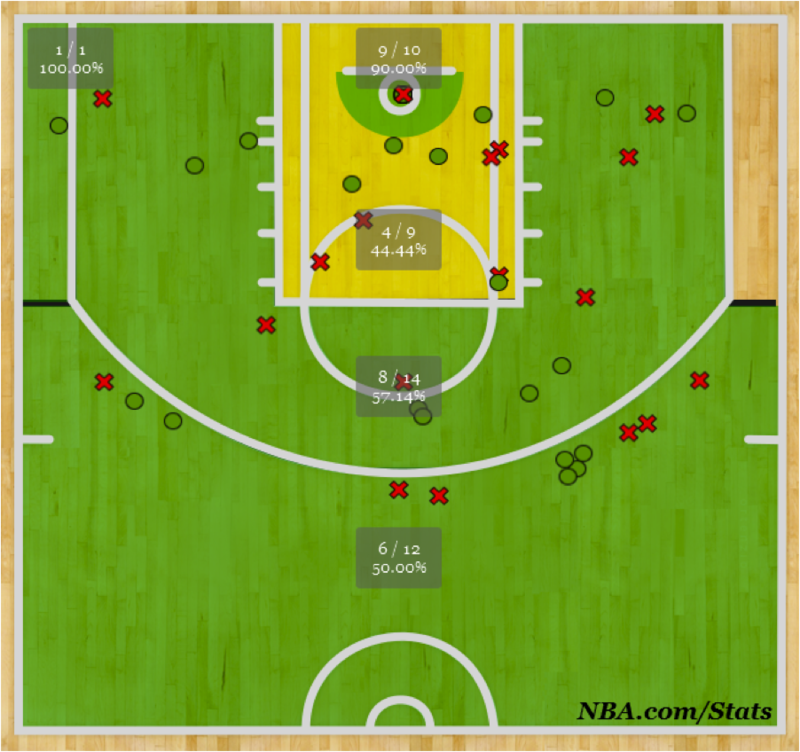 Multiplying those 17 hypothetical shots by his season average of 1.3 points per shot attempt, yields 22.1 more points, totaling 103.1 points on the night. Furthermore, on Bryant’s 81-point night, he averaged a full .182 more points per field goal attempt than Wilt (1.47 PPA). While theoretical numbers cannot be the pivotal point of the argument, of the players in the top 10 for shot attempts in one game, Kobe Bryant’s 1.76 points per attempt stands alone at the top of the list. To continue to assess the true impact that Kobe Bryant and Wilt Chamberlain each had on their respective games, we can also look at the share of the scoreboard each player possessed. Wilt Chamberlain posted an incredible 59% of his team’s total output, and 31.6% of the total output for both teams. While Wilt’s numbers solidify the significance of his scoring feat, they still fall short of the numbers that Kobe Bean Bryant posted. Kobe was responsible for an incredible 66% of his team’s total output and 36% of the entire game, both of which are the highest in NBA history. While both of these prolific scoring events must have occurred at, least partially, as result of abnormal scoring patterns from teammates, it is evident Wilt’s was to a greater extent. Kobe Bryant contributed 46 of his team’s 88 FGA (52%), while Wilt attempted 63 of his team’s 115 (55%).6 Furthermore, in this case it is more than the numbers that do not lie. As Wilt states himself in his autobiography, "…my teammates wanted me to do it, too. They started feeding me the ball even when they were wide open." He then continues, "I really think I shot too often in that 100-point game—particularly in the fourth quarter, when everyone was egging me on toward 100." This came as a result of a blowout, in which points at the end of the game were irrelevant and the team’s main goal became getting Wilt to 100. The Sixers went into the fourth quarter with a 19-point lead on the Knicks, eventually winning by 18. The Lakers, on the other hand, were up only 4 points with 7 minutes left in the game; at which point Kobe tallied 22 more points to carry the Lakers to an 18-point victory.7 In classic Kobe fashion, he stepped up when it mattered most. As he battles persistent injuries and age, let us not forget the great player that Kobe Bryant once was, and let us not forget the greatest individual scoring performance in NBA history.